JG Thirlwell will bring his Cholera Nocebo project to London with an exclusive performance at Cafe Oto on Dec 16 2014. Cholera Nocebo is a 50 minute electro-acoustic presentation performed by JG Thirlwell with electronics, autoharp, objects and prepared piano. It is an immersive multi channel composition which allows for an elastic performance incorporating live re-composition and improvisation into the structure of the work, incorporating musique concrete and electronic sound along with live instrumentation. 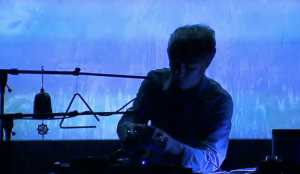 Thirlwell performs with a projection of a time-lapse car journey along the Long Island Expressway in NY which gives the illusion of hurtling into a void, culminating in footage that was shot in the blackout which occurred in the aftermath of Hurricane Sandy, which devastated NYC. Conceived as his “pangaea” project, Thirlwell will perform it on each continent. It has thus far been performed in Marrakech, Istanbul, Stockholm and Lausanne.